5- Teradyne 1850/1820 ICT Testers. 2- HP3070 Series 2 ICT Testers. Full Implementation of the Oracle ERP system. SMT from single layer to 14 layer PCB including Teflon and FR4. SMT processing of 0402 chips, 12mil QFP, and micro BGA. 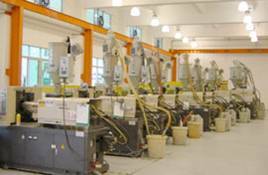 Services including injection molding, spray painting, silk-screening, and EMC coating. Sub Assembly and full OEM product development. Supporting prototype and production quantities for product development. Full Turnkey procurement and material management. Long-term cost reductions from continuous sourcing. We maintain continuity, quality, and the best pricing throughout a product lifecycle. We deliver on time at your cost target. Our staff is flexible and responsive.